Despite the title of this web site, there were no Victorian cinemas, at least not as we would understand them. 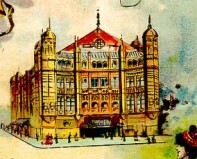 Films were exhibited in the 1895-1901 period in pre-existing auditoria, such as theatres, music halls, amusement parlours, village halls and salons. However, booths began to appear on fairgrounds which were dedicated to the exhibition of films and prefigured the cinemas and nickelodeons that were to emerge a few years later, as films became longer and their popularity grew. Below are some of the most notable film venues of the Victorian period. In 1893 Eadweard Muybridge presented motion sequences at his Zoopraxographical Hall at the Chicago World's Columbian Exposition. The imposing building was close to the famous Ferris Wheel on the Midway, where popular and exotic exhibitions were located. In the Hall Muybridge exhibited discs with hand-drawn images (some coloured) taken from his sequence photographs of animals and athletes using his Zoopraxiscope projector. Audiences would have seen life-size animated images in brief motion (a second or two before the action repeated itself). The Zoopraxographical Hall was arguably therefore the world's first moving image theatre, though it was not exhibiting 'films' as such. The exhibition was not a success (Muybridge made a profit of just $213.43). Signs outside the Hall in the photograph say 'Zoopraxographical Hall' and 'Zoopraxiscopical Circus'. (Some histories state that Thomas Edison's Kinetoscope was exhibited at the Columbian Exposition, but although it was announced it was never exhibited there). Before there was projected film there was the peepshow. The first commercially successful means of exhibiting film was the Edison Kinetoscope, which was mostly commonly presented to its public in 'parlours', generally converted shops which displayed rows of the peepshow machines, each showing a single, brief film. The first such parlour in America was that run by the Holland brothers at 1155 Broadway, New York, which showed Kinetoscope films to the public for the first time on 14 April 1894. Many other such parlours followed, including the one in Detroit illustrated here, which was managed during 1895 by Charles Urban. In Britain, the first Kinetoscope parlour was at 70 Oxford Street, London, managed by Maguire and Baucus, which opened to the public on 17 October 1894. Other early Kinetoscope parlours were opened at 20 boulevard Poissonnière, Paris (1 October 1894) and 148 Pitt Street, Sydney (30 November 1894), and across the world for a year or so, before being overtaken as a commercial attraction by projected film. The first commercial presentation of the Lumière Cinématographe was on 28 December 1895 at the Salon Indien, Grand Café, 14 Boulevard des Capuchins, Paris. The Salon Indien was a small hall located in the basement of the Grand Café, and seated around 100. An invited audience attended the afternoon performance. The ten films believed to have been shown that day were La Sortie de l'Usine Lumiere a Lyon, La Voltige, La Peche aux Poissons Rouges, Le Debarquement du Congres de Photographique a Lyon, Les Forgerons, Le Jardinier, Le Repas, Le Saut a la Couverture, La Place des Cordeliers a Lyon and La Mer. Contrary to what many popular histories assert, this was not the first commercial presentation of projected film (that had been achieved by the Lathams on 20 May 1895), nor did the show feature the celebrated film showing an arrival of a train. It was at the Empire that the Lumiere Cinématographe opened as a attraction on 9 March 1896, having previously been shown at the Polytechic in Regent Street. This was the first time that films had been seen in London's West End, and the film programme enjoyed a run of eighteen months. 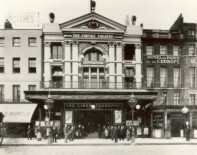 The Empire, located at the north of Leicester Square, first opened as a theatre in 1883, with around 2,000 capacity, soon becoming a 'Theatre of Varieties' and showing a music hall and variety programme. After the Lumiere debut, the Empire showed films occasionally, before it closed on 22 January 1927, reopening on 8 November 1928 as a 3,000-seater cinema, still known as the Empire. An entirely new cinema was built on the site in 1962. It continues as a cinema and is now a three-screen venue. The Alhambra opened as The Panopticon in 1851, showing a mixture of circus, music hall and scientific demonstrations. It became a theatre in 1871, turning to music hall not long after it burned down in 1882. It became one of the highspots of London's West End, and on 25 March 1896 Robert Paul's Theatrograph (billed as the 'Animatographe') opened as part of the variety programme, running continuously as an attraction until June 1897. The Alhambra continued to include films in its variety programme, most notably for the early period Charles Urban's natural history films entitled 'The Unseen World', first showcased in August 1903. The theatre was demolished in 1936 and replaced the following year with a cinema, the Odeon, which still stands. Koster & Bial's Music Hall stood at Broadway and Thirty-fourth Street, New York, where Macy's store stands today. 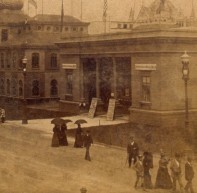 John Koster and Albert Bial first opened a concert hall on 23rd St on 5 May 1879. In 1893 they bought the Manhattan Opera House from Oscar Hammerstein Sr, and, suitably remodelled, it re-opened as Koster & Bial's Music Hall. It was here that the Edison Vitascope received its premiere, on 23 April 1896. The projectionist was the projector's co-inventor, Thomas Armat, while a later projectionist at the venue was Nicholas Power. Koster & Bial's was also the venue at which a number of the early performers for Edison's Kinetoscope appeared, such as Annabelle. 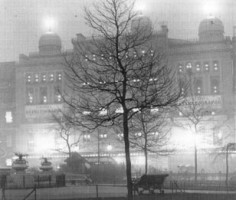 The music hall continued to include film presentations among its variety programme, including Biograph shows, until its closure on 21 July 1901, when the site was sold to Macy's. The Théâtre Robert-Houdin was renowned as the most famous magic theatre in Paris, if not the world, when Georges Méliès bought it in 1888. Robert-Houdin was a renowned conjuror, how had opened the theatre that bore his name in 1854. It was on the first floor of 8 Boulevard des Italiens, Paris, and seated around 200. Robert-Houdin himself never appeared there. Méliès reopened the theatre in October 1888, and developed many stage illusions there, generally as part of comic fantastical sketches. These naturally to his particular mode of cinema. He began making magic films in late 1896, the first of which being Escamotage d'une Dame chez Robert-Houdin. His films became part of the magic repertory at the Théâtre Robert-Houdin, and many of his films employed elaborate sets which made it appear as though they had been performed on the stage of the theatre. He also used performers who regularly appeared at the theatre. The Théâtre Robert-Houdin closed with the onset of the First World War, by which time Méliès' fortunes had declined considerably. It was demolished in the 1920s to make way for the Boulevard Haussmann. The Eden Musée was located on Twenty-Third Street, New York City. It opened as a public entertainment venue in 1884, showing a combination of waxworks and music concerts. 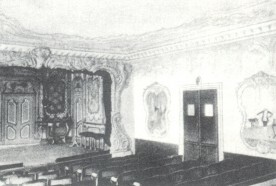 The venue demonstrated a 'pre-cinema' interest in motion pictures when it exhibited Ottomar Anschütz's viewer, the Electrical Schnellesher in 1892. In 1895 it started featuring Charles Chinnock's imitation peepshow Kinetoscopes; then on 18 December 1896 it added motion pictures to the programme, with the Lumiere Cinématographe. It rapidly became the prime film venue in New York for the late Victorian period. Later attractions included the Cinematographe- Joly, Eberhardt Schneider's Cinematograph, and a bogus film of the Oberammergau Passion Play, directed by Henry C. Vincent and filmed by William Paley. Its manager was Englishman Richard G. Hollaman, while its most notable film practitioner at this time was Edwin S. Porter, who served as projectionist and who helped construct the theatre's renowned multi-media (film, songs, slides, sound effects) presentations of films taken on the Spanish-American War. The Eden Musée continued to show occasional films, but eventually moved location in 1914, ending up on Coney Island. The Palace theatre was opened by Richard D'Oyly Carte under the named The English Opera House in 1891. It was not a success until taken over by Charles Morton, who turned it into the Palace Theatre of Varieties. It became one of London's leading variety theatres, and in March 1897 it became the showcase home for the films of the 'American Biograph'. Biograph films employed a unique 70mm format which helped give an exceptionally large and clear image which filled the proscenium arch. 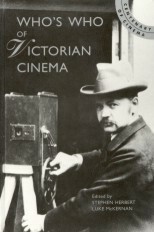 The Biograph shows at the Palace included newsfilms taken from around the world, many of them by William Kennedy-Laurie Dickson, including his renowned films of the Anglo-Boer War throughout 1900. The Palace coninued to shows films as part of its variety and musical programmes, and remains a theatre known for its long runs of musicals and particularly associated with the works of Andrew Lloyd-Webber. The real roots of the cinema that was to come lay not in the variety theatres but in fairgrounds. Fairground shows had always featured ghost shows, marionettes and 'living pictures' (tableaux) and from the late 1890s they naturally accommodated film shows. The elaborately-decorated booths some came to be known as bioscopes, and the largest could accommodate a thousand visitors (many standing) at a time. 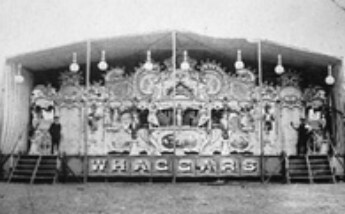 According to legend, the first fairground operator to host a film show was Randall Williams, and many of those who followed after him became significant film exhibitors - some, like the Welshman William Haggar, whose bioscope show is illustrated, moved into film production as well. The fairground bioscopes demonstrated the popularity of an auditorium that regularly and exclusively showed film. They were popular in Britain throughout the Edwardian period but gradually died out as permanent cinemas took away their audience.